After a boy witnesses a girl with an invisible silhouette being chased by a monstrous creature, his curiosity gets the better of him and he takes off after her. He eventually follows her and the monster through a large set of doors, only to become invisible himself. He turns around to see a new world, one that differs from his own yet looks similar. In his confusion he misses the girl as she runs off in an attempt to escape the monster. He feels the need to follow her, to save her, to help her escape the monster. Soon the children find themselves alone in an unknown world full on rain drops and perilous situations. Throughout the story the children must find one another and work together, this creates a cooperative dynamic. 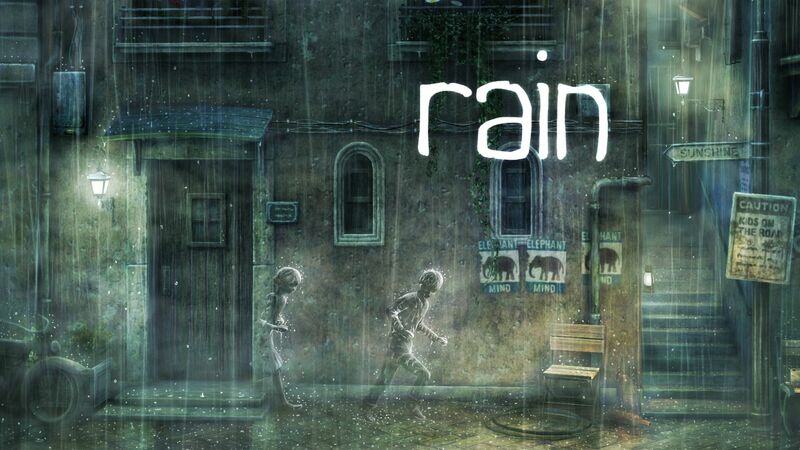 Instead of being a typical boy-saves-girl type of game, rain focuses on the two children working as a team of equals. Since both of them are young, scared, and confused they must rely on each other to find answers and return to their normal state of being. The game is narrated through words displayed on the screen and is told almost like a children’s story, which gives it an endearing feel and makes it very easy to follow/understand. All in all, rain’s storyline is captivating, emotionally enticing, and genuinely heart-warming. Rain’s gameplay is simplistic. The children are only able to walk, run, and jump through the town. There are platforming moments, but they aren’t too advanced though they are used throughout the game. It’s more jumping from one object or ledge to another while maneuvering through the town. There is no combat, though a slight stealth element is implemented on occasion when the player must hide from and sneak around enemies. Since the children are invisible unless they are in the rain, hiding under awnings or other protruding objects renders you unseen by enemies, as well as by the player. Only footsteps can be seen in the rain-less areas of the game. As the game gets going, the two children work together to get around. The boy lifts the girl onto ledges so that she can drop ladders for him and some boxes are too heavy for either of them to push alone. This creates a cooperative dynamic between the playable boy and the NPC girl, which is well done and further strengthens the character’s bonds to one another. On occasion the boy and girl must run from large enemies, working together to throw the beasts off their trail. This mixes up the gameplay to an extent, it hardly feels like the same exact thing and place over and over again. All of this works really well with the overall atmosphere of the game, creating a world in which the player is supposed to be afraid and vulnerable. I do not mean that this is a horror game, but being alone and confused creates a kind of fear. Not being able to fight enemies with weapons or even bare hands makes the player feel a great sense of caution as well as a need to protect the young boy and girl. Anchored by “Clair de Lune” by Claude Debussy, rain brings the goods acoustically. Beautiful piano pieces as well as bandoneon themed music bring the game together when paired with the lovely sound of rainfall. One of the most stunning parts of rain would have to be the soundtrack, without Yugo Kanno and his composing talents rain may have fallen flat. The game itself looks gorgeous, the dark town filled with old world products and covered in a veil of rain gives the game very pleasing aesthetics. The artwork is a mixture of beautiful watercolor artistic pieces blended with realistic gameplay images. The town that the game takes place in is interesting, as the game progresses we are brought to different areas of the town and experience different situations based on those areas. There is no voice acting and little sound besides the soundtrack and falling rain. The simplistic feeling only assists the allure of the music and setting, making rain a truly unique gameplay experience. The game is roughly 3-4 hours in length and does posses a moderately high replayability. There is a new “mode” unlocked after the first completion of the game in which memories are scattered about and collecting them earns the player trophies. The game is currently $14.99 and is available for download on the PlayStation Network. Rain supports one player and is not 3D compatible. Where’s the score?! How am I supposed to know if the games any good without a score? Actually READ the review? That’s just unreasonable. Obviously I’m kidding. Great review once again. I’ve had this game on my radar and plan to pick it up in the future.